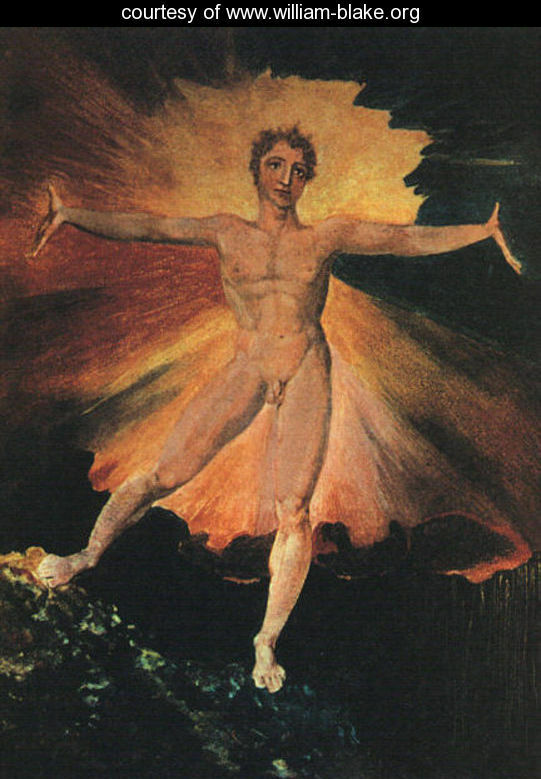 Why might a Buddhist be interested in Blake? Why might an admirer of Blake be interested in the Buddha? So, with the help of many, they lovingly restored the city to its former glory, and cleared the ancient trackway so that all could follow it. William Blake lived in late eighteenth century London, when it was the biggest city in the world – a dirty and stinking place with a sinister repressive government at its hub, teeming with little tyrants and their victims. Blake saw all this very clearly. He felt pity and anger. Yet he was a visionary, and he also saw a different city, made of light. His was not a utopian vision of an ideal marble London. For him, the harmonious city of light was the human mind, his own and everybody’s mind, completely liberated from the oppression of self-obsession, cleansed of the smoke and grime of error. He called the perfect city Jerusalem. If Blake had been more ordinary, he might have dreamt again and again of his Jerusalem, sighing when he woke. He might have taken to the streets to demand that someone build it for him. Or more probably, the everyday oppressions of life might have smudged the image, until all that he was seeking was a bit of recognition, a reasonable income as an engraver and painter, and a few cronies to reminisce and grumble with. However, Blake was not ordinary. His vision changed and became more dynamic. He took his eyes off Jerusalem’s glistening spires of golden light, shimmering on the horizon. His new vision was of a city to be built with work and action, with conversations and personal connections, and particularly by the artist. This city, which is always being built, he called Golgonooza. I have a strong sense that Blake’s city of art is the same as the city being restored in the Buddha’s vision. However, even if the cities are the same, the path of artistic creation would seem to be a very different from the trackway of a Buddhist life. 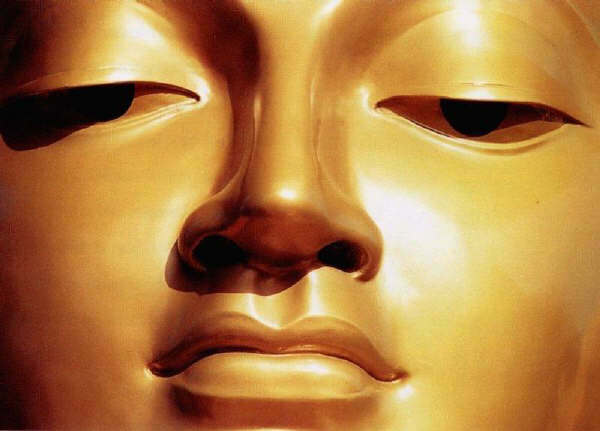 Was Blake’s track the same as that of the Buddha? The ‘city’ and the ‘track’ are not to be taken literally: they are no more than ideas until they are lived, and when they are lived, they are images with a life of their own, and these words become superfluous. Here and now we are wandering through a thick forest. There is something wrong, something lacking. The world falls short of our desires. We have a sense that we are staring at an engraved print, and we can’t find the window that looks out onto the real thing. As we look at this two-dimensional illustration of life, we feel a longing. It may occasionally be a longing for the complete unbounded green landscape itself, but often it is one of many little longings stimulated by some little shape in the illustration. The imagination is vast, but the world that flickers through our senses is small, and so frustration and pain are endemic. In the vast world glimpsed in complete Imagination, there is no need for any limit of any kind, not even the separation of the inside, my mind, from what I think of as an indifferent world outside. That completely open dimension is not something to be manufactured, and it is not in any way limited by our inability to dwell in it, and so, for Blake, it is an eternal realm from which conscious beings have wandered. His task is to restore us to that open realm. He sees himself and others as human beings to be perfected through great struggle. As he advances, his surroundings will light up more and more, their imperfections will drop away, until he finds himself as the ideal man, within Jerusalem. Here in the thick forest there is something wrong, there is a lack, and we are scrabbling about driven by the sense of lack. It is like an intense thirst, but most of what we drink quenches that thirst only briefly, if at all. The Buddha and Blake share an intense optimism, which one feels must have come from their genuine discoveries. They both thought that lack, thirst and aimlessness are not inevitable. But we have to have the courage to see what it is that we do that is not working. What Buddhism characterises as a desperate thirst, Blake dramatises. Here is a stupendous human being, like a god, who has become estranged from the eternal city of Jerusalem: he is Blake himself, Everyman. As a Christian, he might have called him Jesus, but he decided that his name is Albion, the Sleeping Lord whose bones are the hills of Britain, or who is made up of all the people of Blake’s own nation. Albion is asleep, or perhaps dead. In his dreams, Jerusalem has become his estranged wife, and his divided mental life has cascaded into two, and then four, and then many beings, clasping or fighting each other, as they grapple with their dim memory of something lost. Blake’s prophetic poems describe the cruel selfishness of the female emanations and the male spectres in the fallen state. For Blake, the dream drama of Albion’s fragmented selves is not an utter nightmare, because he can begin to identify the different characters, and discover the games they are playing. Far worse would be an undifferentiated confusion in which there is no awareness at all. Nevertheless, confusion and tragic misunderstandings underlie most of our attempts to express our longings in the fallen world. Confusion, rationalised, becomes error. If only error can be given a clear outline and compelled to fully reveal itself, then it can be overcome. If, as Blake claims, “Truth can never be told so as to be understood and not be believed”, then when error is uttered clearly enough, it must be seen through. 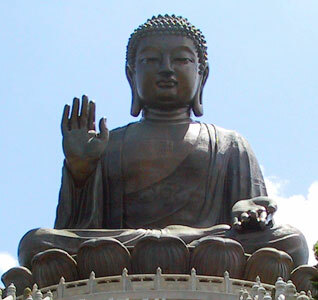 For a similar reason, the Buddha strove to expose what he called false views. He and Blake both felt that evil ultimately comes from a basic confusion. What is really immoral is not to disobey a set of ordained laws, but to act from the fear, thirst, and cruelty that we use to defend a selfhood trapped in confusion. Confusion perceives a divided world (the Buddhist word for ordinary consciousness means “divided knowing”), corresponding to the fragmentation of the giant Albion. We can change our perception and escape from confusion by trusting what Blake at first calls the Poetic Genius; in trusting it, it strengthens. Later, he calls it Imagination or Vision: it corresponds to the Buddhist term shraddha. Usually translated as ‘faith’, this is a combination of a vision of what is truly significant in life with a longing to create a truly significant life. It comes from an expansion of awareness. Here, Buddhism stresses mindfulness practice, and Blake’s practice of mindfulness was the exercise of his acute powers of observation through drawing and writing. “A Poet, a Painter, a Musician, an Architect: the Man or Woman who is not one of these is not a Christian”, by which he meant someone willing to expand his or her visionary awareness. Although there are other means, it seems to me that some kind of artistic practice is probably the best way for us in this secular age to cultivate shraddha. Shraddha, vision, is an enlargement of perspective, which opens the space for an energetic engagement with life. 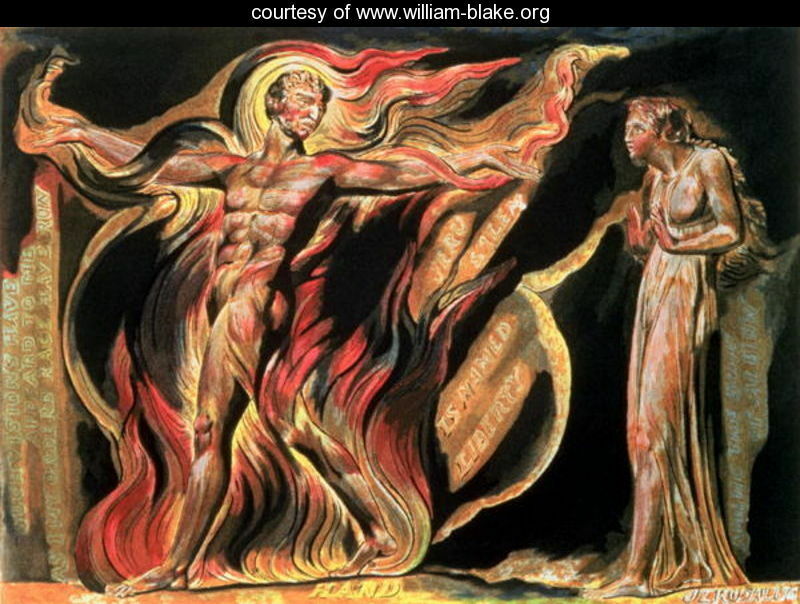 “Energy is Eternal Delight,” says Blake, and the free expression of energy is perhaps the prime Blakean virtue. Life and consciousness provide unlimited reserves of energy to every human being, but energy remains inhibited, often because what one feels like doing with it is thought to be unacceptable or wicked. Here we come to an apparent difference between traditional Buddhism and William Blake. For Blake, at least according to his rhetoric, any form of restraint is wrong. “Those who restrain desire, do so because theirs is weak enough to be restrained; … being restrained, it by degrees becomes passive.” Buddhism however insists that genuine spiritual energy must always be put into what are called ‘skilled’ states of mind. ‘Unskilled’ states of mind should be subject to restraint, because of the dreadful consequences of acting from them. Consequently, I puzzled for a long time over Blake’s proverb “Sooner murder an infant in its cradle than nurse unacted desires.” It seems to say that you should do whatever you feel like doing, even if it causes harm. At first I thought that as a ‘Proverb of Hell’ it was intended just to shock. Later I concluded that Blake sincerely meant what he wrote, and at the same time wished no one to harm another. Desire is an uprush of energy, and that energy is potentially enormously creative, but festers if it is allowed to stagnate. So it is crucial to use desire, or energy, as a basis for action, even if it is only mental action. Desire is a signal to create, and the fuel of creativity. Joyful engagement is the way of grappling creatively with one’s surroundings. The most significant element of one’s surroundings is other people. Blake said “Mutual Forgiveness of each vice / These are the Gates of Paradise”. 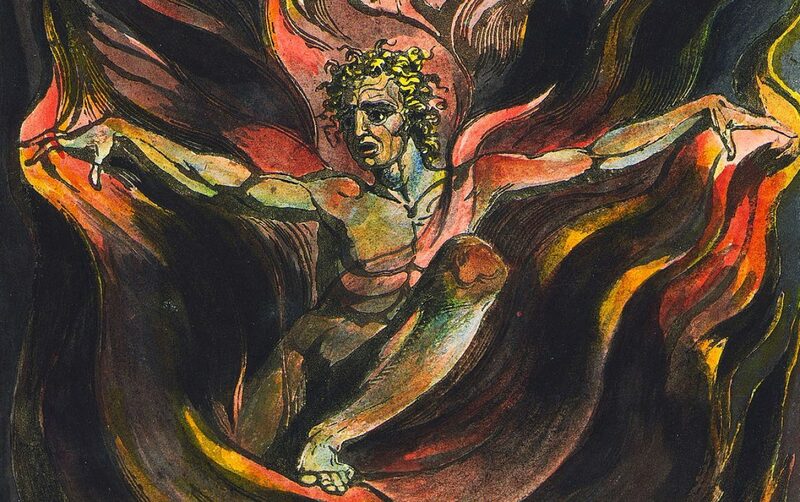 It is easy to be overwhelmed by the flaming energies into which Albion has fragmented in Blake’s writings, and thus miss both the motive and message of his work. He seeks the cleansing of our vision because we are in such a terrible plight: he wants everybody to be able to live in what he calls Eternity, in mutual love, and he wants this because of the swelling of love in his own breast. Blake marvellously displays the greatest Buddhist virtue – compassion. Blake ran along the ancient trackway, and came back with excited news of the ancient city, Jerusalem. His vision of that city, and of why it is in ruins, is immensely stimulating. He has also opened up sections of the ancient path, although what is lacking on Blake’s track is ‘samadhi’: intense, calm, one-pointed contemplation of experience in states of deep meditation. As a visionary artist, it may be that he possessed the equivalent of samadhi, but I don’t think he realised that without it, anxiety and vacillation will entangle most of us before we reach the city. The Buddha’s Ancient City: Samyutta Nikaya, 12-65. For the myth of Albion, Jerusalem and Golgonooza, see Blake’s prophetic books Milton and Jerusalem. Ratnaprabha is a member of the Western Buddhist Order. He has published a book on evolution and consciousness, and lives in London, UK. We are constantly co-creating the world we all share with our thoughts and intentions moment by moment. As we work to get clearer in our own vision we become better able to manifest the beauty. (D’you realise, ‘Mr. Naprabha’, if you were a punk rocker I could justly abbreviate your name to ‘Rat’?). Having spent the first seven years of my life growing up in a British equivalent of trailer trash existence in ’60s Liverpool, (not to mention many of my subsequent years lving amongst drug addicted prostitutes who were often either murdered BY their pimps, or murdered WITH their pimps by meat cleaver wielding merchant seacooks the pair of them’d tried to roll), I’m fully aware infants being murdered in their cradles, (if their ‘parents’ haven’t already pawned those cradles), is still a fact of life. Blake too must’ve been aware of this fact, which was probably even more common in his day. In which case, mightn’t he’ve been alluding to the possibility such murders come about precisely because of the cumulative effect of society’s ARTIFICIAL supression of such NATURAL yearnings/desires? In which case, mightn’t a fuller interpretation of his shock jock style meaning’ve been: if you’re willing to ‘murder’ an infant in its cradle rather than not act on your natural ‘desires’ – i.e., not, yourself, be tethered and restrained by society’s bourgeois artficial conventions of what constitutes right and wrong, (or indeed ‘murder’ the infant by imposing them on her or him) – then, paradoxically, you’re far LESS likely to REALLY muder such a child? How similar to the Buddhist explanation of the three poisons of greed, hatred and delusion, which are all fed by ignorance. Not ignorance in the sense of lacking education or knowledge but ‘ignoring the still, small voice’ of conscience.